Check out how you, as citizen-scientist (or just interested amateur) can contribute! Astronomers all over the world are training their eyes and telescopes on Comet ISON as it approaches its closest distance to the sun, called perihelion. Perihelion will occur at 1:44 p.m. on Thursday November 28, Thanksgiving Day in the U.S.A.
Rather than the traditional football game, we’d suggest you watch ISON’s progress around the sun instead. While some predictions suggest that the comet may be visible in daylight, we’d rather you didn’t risk your vision by staring at the sun. It might be possible to block the sun from view with a well placed chimney or lamp post, but there is a better way, and it’s 100 percent safe. There are several satellites in orbit around the sun which are trained on the sun all the time. One the oldest and still one of the best is SOHO, the Solar and Heliospheric Observatory. SOHO was launched in 1995, and carries an array of cameras pointed at the sun. For our purposes, the most interesting one is the Large Angle and Spectrometric Coronagraph #3, or LASCO C3 for short. This shows a field of view about 32 degrees wide. The sun itself is blocked by a disk at the end of a stalk, its diameter marked by a small white circle. Because SOHO is in space, there is no atmosphere to scatter the sun’s light, so we can see the stars surrounding the sun, just as if we were watching a total solar eclipse. Actually, the view is much better than at a total eclipse, with stars down to about 7th magnitude visible. Whenever you check this page, you will see the most recent image from space, usually not more than an hour or two old. Go there right now, and you will see the sun’s current coronal activity and, in the background, the stars on the far side of the sun. 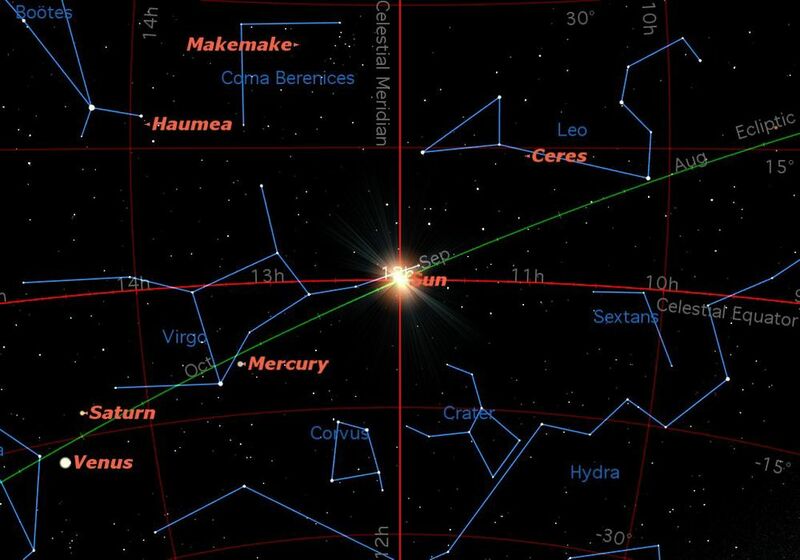 Over the next few days, if all goes well, you will see Comet ISON’s progress around the sun. It should enter LASCO C3’s field of view at the right side on Tuesday November 26. ISON will pass just below the sun on Thursday and then move upwards, leaving the field on Saturday afternoon. In our graphic, the yellow circle shows the LASCO C3 field of view, the gray parabola is ISON’s path, and the stars of Scorpius are in the background. ISON is shown in its position on Wednesday November 27. It’s impossible to say in advance exactly what we will see in the next few days. By watching the comet’s progress in the LASCO camera, you will participate in a great astronomical adventure. Will the comet break up? Will it continue on to be one of the brightest comets in history? As of this writing, no one knows, but by watching it on LASCO, you will know as soon as anyone. As the Earth moves in its orbit around the sun, new constellations are revealed in the east as the old ones disappear into twilight. The bright stars of the Summer Triangle will soon be replaced by the even brighter stars of Orion and his winter companions. During this period of transition, we find ourselves looking outwards from our own galaxy into intergalactic space. This is one of the two best times of the year to hunt for galaxies. The stars of autumn are relatively faint, as we are looking out away from the disk of our galaxy. To see these fainter stars you may need to travel away from your urban or suburban home to seek out the darker skies of the countryside. After twilight falls, look eastward to see the Square of Pegasus, formed by four second magnitude stars, about the same brightness as the stars of the Big Dipper. As the Square is rising in the east, it will appear more as a diamond than a square. The leftmost star of the diamond, Alpheratz, marks the head of Andromeda. Two streams of stars extend to the left from Alpheratz, pointing towards Perseus, just below the "W" shape of Cassiopeia. Most people have never seen another galaxy. In fact, most people today have never seen the galaxy in which we live, because the widespread glow of light pollution blocks the Milky Way's faint light. It’s only on rare occasions of major power failures that city dwellers get to see the Milky Way. This faint glowing cloud may not seem impressive, until you realize that its light has been traveling for more than two million years to reach your eyes. When that light began its journey, our ancestors were just a bunch of small primates wandering on the plains of Africa. Go back to Mirach and its companion, but this time, follow the line in the opposite direction. This will lead you to an even fainter cloud, the Triangulum or Pinwheel Galaxy. This is a smaller galaxy than Andromeda, but located at about the same distance from us. Even though this is one of the brightest and nearest galaxies in our sky, it is unusually difficult to see. That’s because it is almost at right angles to our line of vision, so we are seeing it in plan view. As a result its feathery edges blend into the background, and we have no sharp edge to catch our eye. There will be a partial eclipse of the moon on Friday October 18. The moon will pass through the edge of the Earth’s shadow, ending up partially in the shadow of the Earth. When a shadow is cast by a nearby object, the penumbra is very slight. When the shadow is as far away as the moon is from the Earth, the penumbra is quite wide. For observers in Africa, Europe, and western Asia, the eclipse will occur in the middle of the night when the moon is high overhead. The partial shading will be visible as a slight reddish dimming of the normally bright full moon. For observers in North America and South America, maximum eclipse will be around the time of moonrise, which is also the time of sunset. This will make the eclipse difficult to see, because we will be looking for a slight dimming of a moon which is already dimmed by passing through a great deal of the Earth’s atmosphere. The farther east and north you are located, the better your chances of seeing this eclipse. For example, in New York City, the moon will rise at 5:59 p.m. EDT, and will be at an altitude of 20 degrees at maximum eclipse. In Chicago, moonrise is at 5:54 p.m. CDT and the moon’s altitude only 9 degrees at maximum eclipse. In Los Angeles, moonrise is at 6:09 p.m. PDT, more than an hour after maximum eclipse, so the chances of seeing the eclipse are zero. For observers in North America, the effects of the moon’s shadow will be most pronounced on the lower right corner of the moon. The shadow will probably be more pronounced in photographs than with the naked eye, so this is a good opportunity to get out your telephoto lens and photograph the rising moon. Remember that maximum eclipse will be at 7:50 p.m. EDT and 6:50 p.m. CDT. A rare planetary viewing event occurs this week when three of Jupiter’s largest moons cast their shadows simultaneously on the planet below them: three solar eclipses at the same time. An eclipse of the sun happens when a moon casts its shadow on the planet below it. For observers located where the shadow falls, the sun appears to be completely blocked by the moon, and they are able to see the prominences and corona around the occluding moon. In the Earth-moon system, the Earth is a fairly small target and its moon is far away, so it’s rare for the moon’s shadow to fall on the Earth. On average it happens about twice a year, and the diameter of the shadow on the Earth’s surface is quite small, only a couple of hundred miles in diameter. To see a solar eclipse, you need to be in exactly the right place, the place where the moon’s shadow falls. Because our moon’s orbit is tilted with respect to the Earth, most of the time the moon’s shadow passes above or below the Earth, and no eclipse occurs. Only about twice a year do the three bodies line up exactly so that the moon’s shadow touches Earth. This next happens on November 3. With Jupiter, the situation is different. Jupiter has four large moons: Io, Europa, Ganymede, and Callisto. These are relatively close to Jupiter and Jupiter is much larger than Earth. As a result, the shadows of Jupiter’s moons cross its face very frequently. The innermost moon Io causes an eclipse on Jupiter once every 1.8 days (42 hours). Even the outermost moon, Callisto, traveling much more slowly, should cause an eclipse every 17 days. In fact it does so less frequently because, like our moon, sometimes its shadow passes above or below Jupiter. So, if eclipses on Jupiter happen very often, why don’t we see more of them? The timing has to be exactly right. Io may cause an eclipse on Jupiter every 42 hours, but the eclipse itself lasts only a little over 2 hours. Also, Io’s shadow is very small; you need a telescope with at least 90mm aperture to see it. If you aren’t looking for it, you probably wouldn’t see it at all, it’s that small. Also, because of the Earth’s rotation, Jupiter is below the horizon half the time, and often lost in the daylight sky. If the shadows of its moons fall so often on Jupiter, what are the chances of two shadows falling simultaneously? Pretty good, it turns out. This is especially true because there is a resonance between the orbits of Jupiter’s satellites. Europa’s period of revolution is almost exactly twice that of Io, and Ganymede’s almost exactly four times. Only Callisto doesn’t keep step with the inner satellites. As a result, double shadow transits usually happen in a group. The current group started with a double transit of Io and Europa’s shadows on September 28 and will continue every few days until November 13. Keep an eye on the moons themselves, because they will also begin to cross Jupiter’s disk: Io at 1:48 a.m. and Europa at 2:02 a.m. There’s an added bonus in the Great Red Spot also transiting at this time. It helps to visualize the moons’ movements in three dimensions, with the sun seeming to come from over your left shoulder. Sometimes you get an almost three-dimensional effect with the moons casting their shadows on the planet beneath. If you miss this event, there will be three double shadow transits later this month visible over most of North America, on October 16/17, 18/19, and 25/26. In each case, the events mostly occur after Jupiter rises around midnight on the first date, so that’s the night you should mark on your calendar. Remember that the date changes at midnight. Most of the planets in the solar system hover close to the sun, which illuminates them and makes them among the brightest objects in the sky. The outer planets, Uranus and Neptune, are far from the sun and catch few of its rays, making them dim and hard to find. Uranus, for example, reaches opposition with the sun on Thursday October 3. Directly opposite the sun in our sky, it is at its closest and brightest, yet it is only just barely visible to the unaided eye in a dark moonless sky. For most people, a binocular will be an essential tool for spotting Uranus. This is done through a technique popular with amateur astronomers called “starhopping.” We use the brighter stars as guideposts to locating faint or distant objects. In this case, we start with the most prominent group of stars in the autumn sky: the four stars that form the Square of Pegasus. Although not among the brightest stars, these are all good second magnitude stars, about as bright as the stars in the Big Dipper. Many people who go looking for the Square of Pegasus miss it because it is so large. The four sides of the Square are roughly 15 degrees long, about the length of the handle of the Big Dipper. Look for them in the east as the sky gets dark around 9 p.m. At that time the Square is rising, so is tilted over, making it more of a diamond shape than a square. Now we begin our “starhop.” We start with the two stars that form the bottom of the square (if you’re in the northern hemisphere). Make that one side of a south-pointing equilateral triangle. The southern point of the triangle marks the “Circlet,” part of the dim constellation of Pisces. This is an oval of dim stars, more easily seen in binoculars than with the unaided eye. To the left of the Circlet is a chain of stars, part of the chain that binds the two fish of Pisces together. The first two stars in this chain are a bit brighter than the rest. About half way between these two stars, and a bit to the south, you should find Uranus. How will you know you have found it? First of all, although dim, Uranus is brighter than any of the stars in this area. Secondly, it has a distinctive blue-green color, quite unlike any star. Finally, if you plot its position relative to the stars, and check again in a few days, you will find that it has moved to the right. Of course, the acid test is to point a telescope at it. Most newcomers to astronomy are surprised at how small any of the planets appear in a telescope, but Uranus is smaller still, a mere 3.7 arc seconds in diameter, about a tenth the size of Jupiter. Unless you have a very large telescope, it will appear as nothing more than a tiny blue-green pinhead. As the constellations of summer depart from our sky, they are replaced by what are often called "the watery constellations." These include normal sea creatures like fishes and dolphins, and even Aquarius carrying a water jug. Among these watery creatures are some strange creatures which we would call monsters: strange combinations of parts of unrelated animals. The first to appear is Capricornus, the Sea Goat. Seen in the lower right of our chart looking southward on an autumn evening in the northern hemisphere, he combines the front end of a goat with the rear end of a fish. Most people would be hard pressed to see either a goat or a fish in this large triangular group of stars. I see it more as a tricorn hat turned upside down. The front end of the goat, to the right, is marked by two wide double stars, Algedi and Dabih, a fine sight in binoculars. “Algedi” or “Al Giedi” is Arabic for “the goat.” The rear end of the fish is marked by Deneb Algiedi, which translates from Arabic as "the tail of the goat." Much of our knowledge of ancient astronomy, along with mathematics and other sciences, has been passed down to us by medieval Arab scholars. In the process many of the old star names were translated into Arabic. As a result, astronomers learn a bit of Arabic. "Deneb" is Arabic for tail, so turns up in many star names in constellations derived from animals. The most famous is Deneb in Cygnus, marking the tail of the Swan. "Al" is Arabic for "the" and turns up in many scientific words like "algebra," "alcohol," and "alkali." In the lower left corner of our chart we find another monster, Cetus. Modern astronomy books usually translate this as "the whale," but our chart shows a much stranger creature. it has the head of a dragon, webbed feet, and a fishy tail. This tail is marked by one of the few bright stars in this part of the sky, Deneb Kaitos. With our new knowledge of Arabic, we can translate this easily as "the tail of the whale." Buried in the heart of Cetus is a remarkable star called Mira, which means “wonderful” in Latin. This was discovered by David Fabricius in 1596 to be a star which varies in brightness, one of the first variable stars to be discovered. Flying high above these watery creatures is yet another monster, a horse with wings called Pegasus. This is probably one of the most familiar mythological creatures, so familiar that most people never think of how strange a flying horse would be. The celestial flying horse is marked by four fairly bright stars forming an almost perfect square, the Square of Pegasus. When I first went looking for Pegasus in the sky, I made a common beginner's error. Because I was using a small star chart, I looked for a small square of stars in the sky, and totally missed it. The constellations in the sky are much larger than they appear on star charts. So look for a really large square of stars. Actually, only three of the four stars in the Square are part of Pegasus. The star in the upper left corner is Alpheratz, actually part of the constellation of Andromeda. But that is another story. Most people know that something called the “equinox” happens twice every year around March 21 and September 21, but don’t really know what that means. Here are the real facts about the equinox. The Earth moves in two different ways. First, it spins on its polar axis, a line through the north and south poles, once every 24 hours, causing the alternation of day and night. Secondly, it moves in its orbit around the sun once every 365 1/4 days, causing the annual cycle of seasons. The equinox occurs when these two motions intersect. Because the Earth is very massive, its mass has an enormously powerful gyroscopic effect. For this reason, its poles always point in the same direction, although a major earthquake can cause tiny wobbles in this axis. Most importantly, the Earth’s motion around the sun has absolutely no effect on the direction the poles are pointing, which has very important consequences for Earth’s seasons. Astronomers mark the positions of objects in the sky relative to the Earth’s poles of rotation: those are the red lines you see in the chart. The most important line is the celestial equator, which divides the sky into northern and southern hemispheres. The Earth’s pole of rotation is tilted 23.4 degrees relative to the plane of its orbit. This tilt is always towards the same point in the sky, called the celestial pole, no matter where in its orbit around the sun the Earth happens to be. This tilt has the effect on the surface of the Earth that the sun appears to move across the sky at an angle to the celestial equator. This is marked by the green line in the chart, called the “ecliptic” because eclipses happen along this line. Twice a year, the sun crosses the celestial equator, moving from the northern hemisphere to the southern hemisphere or from the southern hemisphere to the northern hemisphere. These two crossings are very important for the inhabitants of Earth, because they mark the change in the direction the sun’s rays fall on the Earth. Specifically, on September 22, the sun will move from the northern hemisphere to the southern hemisphere. It will pass overhead everywhere along the Earth’s equator on that date. It will rise exactly in the east and set exactly in the west. After that date, the sun will shine more on the southern half of our planet, and less on the northern half. Summer will be over in the northern hemisphere, and winter will be on its way. Also, winter will be over in the south, and summer will begin. The sun will continue on its path southward for the next three months, reaching its southernmost point on December 21, the date called “solstice.” In the northern hemisphere, the days will become shorter, the nights longer, and the temperatures colder, all the result of the sun’s being south of the celestial equator. It’s always important to remember that this is part of a cycle, and that after December 21 the sun will start moving northward again, and spring will be on its way. The next few nights are the best this month to observe the surface features of the moon. The sun will be rising along the center line of the moon, casting the mountains and craters in high relief. The sun will be rising along the center line of the moon, casting the mountains and craters in high relief. Beginners in astronomy are often surprised that the best time to study the moon is not at full moon, which will occur on Thursday the 19th this month. At full moon the sun is high overhead in the center of the moon, and the surface looks like the desert at high noon. The best time is when the sun is falling obliquely, casting long shadow, which is what you see at the first and third quarters. Third quarter is a bit of a problem because it occurs when the moon is in the dawn sky. First quarter, on the other hand, occurs when the moon is high in the sky at sunset, perfect for evening observing. The moon is so close to us that you don't really need a telescope to study it. Even without any optical aid, the major features of the moon can be clearly seen, if you take the time. In fact, you can see more detail on the moon with your naked eye than you can see on any of the planets with a powerful telescope. When you look at the first quarter moon, you are seeing a sphere lit by the sun from the right side (in the northern hemisphere; left side in the southern hemisphere). The surface of the moon varies in reflectivity, so that you see a pattern of light and dark. The lighter areas are the older mountainous regions, mostly on the southern half of the moon; the darker areas are younger lava flows, mostly in the north. Early observers mistook these for seas and oceans, and named them accordingly. Later astronomers realized that the moon is an airless waterless body, and that its “seas” are dryer than the driest deserts on Earth. The water which has been discovered recently on the moon is buried deep beneath the surface. If you examine the moon more closely in binoculars or a telescope, your attention will be drawn to the “terminator,” the narrow band down the middle of the moon where dark meets light. This is where the sun is rising. Ordinary binoculars can give a surprisingly detailed view of the moon, especially if they are steadied by mounting them on a tripod. Many binoculars have a tripod socket hidden under a small cap in the hinge between their two halves, but you will need a small L-shaped adapter to connect this to a standard camera tripod. You will be amazed at the improvement a tripod mount makes to the view. The 10x50 size binocular is the most popular among astronomers. Its 10 times magnification and 50mm objective lenses provide excellent views of both nearby objects like the moon and distant objects like star clusters and galaxies. In recent years more powerful binoculars have become widely available at amazingly low prices. The 15x70 size gives particularly good views of the moon, but must be mounted on a tripod. Because the sun is rising over the terminator, even the slightest variation in topography is exaggerated by the rising sun. Look especially for craters and isolated mountains on the plains. With the extra magnification afforded by a small telescope, you can actually watch the sun rise over craters in real time. With a good map of the moon you can become familiar with the “geography” of the moon. More than a thousand craters bear the names of famous astronomers of the past. This week, on August 27, the planet Neptune reaches opposition. When a planet is in opposition, it lies directly opposite the sun in Earth’s sky. It is highest in the sky when the sun is lowest, which is local midnight. When Daylight Saving Time is in effect, this is close to 1 a.m. local time. Because Neptune is directly opposite the sun. it rises at the same time as the sun sets, and sets at the same time as the sun rises, so is visible all night. As planets go, Neptune is extremely dim, requiring at least a binocular to become visible. Even in a powerful telescope, it is a tiny blue-green disk with no detail to be seen. Unless you look carefully, you could easily mistake it for a star. In fact, that happened several times before Neptune’s official discovery. Most famously, Galileo twice observed Neptune while studying Jupiter’s moons in 1612 and 1613, but mistook it for a star both times. After the discovery of Uranus by William Herschel in 1781, mathematicians calculated the possible location of another planet farther from the sun, but no one looked seriously for it until 1846. The first to actually spot it was German astronomer Johann Gottfried Galle on September 23. Because it takes Neptune 164 years to circle the sun, it spends an awfully long time in any one constellation. For example, Neptune has been in Aquarius since January 24 2011 and won’t move on into Pisces until May 22 2022. In fact, it has only just completed its first trip around the sun since its discovery, and is again very close to the spot where it was discovered. Since Neptune is so far from the Earth, it presents too small a disk to be studied well with even the largest telescopes. The only good view we’ve ever gotten of Neptune was in 1989 when the Voyager 2 probe passed within 2740 miles (4400 km.) of Neptune’s cloud tops. At that time it recorded two large blue spots in Neptune’s atmosphere, apparently similar to the Great Red Spot on Jupiter. Voyager 2 also confirmed the existence of a faint ring around Neptune, a ghostly echo of Saturn’s ring system.